Husqvarna's powerful and reliable trimmers are the perfect choice trimmers when it comes to give the lawn edges a great finishing touch, as to trim grass at hard to reach places. All machines are easy to handle and are designed to help get the job done as effortlessly and swift as possible. Professional trimmers for mutliple tasks. Light weight trimmers suitable for homeowners. For more information on Husqvarna's professional use trimmers, visit this page. For more information on Husqvarna's versatile use trimmers, visit this page. For more information on Husqvarna's occasional use trimmers, visit this page. 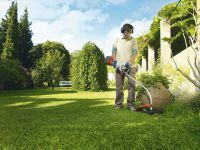 Husqvarna battery powered trimmers are powerful, lightweight and well-balanced weed and grass trimmers. They feature high quality motors with enough torque for the toughest landscaping needs. You can even change trimmer line rotation to avoid grass cuttings landing on walkways. For more information on Husqvarna's Battery Series trimmers, visit this page.